I was sitting in the shade of a mango tree, listening to Betty Wario Okello talk about her students, when I realised that you would probably also like to hear from her. She teaches Form One students at a public school in a poor agricultural community on the outskirts of Mombasa. After we talked about her students, I asked her two questions that I've been asking women across the country. I've been asking them to name one thing, other than money, that would improve their quality of life. I've also been asking to tell me one of their highest dreams for themselves, putting all practical needs aside. Like so many of the women I have talked to, her answers served her children and the community, not just herself. I'll write more about the two questions project in an upcoming blog post, but for now, here's the interview with Betty. I have 106 children in my class. 106. Form One is supposed to be from age six to age eight. But you find that because of the free primary education, I have five [or] six children, the elder one is 15 because she has been staying at home, she has been working as a maid. Now, because of the free primary education, she decided to come to school because she is being overworked. Now if she comes to school most of the time she is busy in the class. But when she is at home, “wash the utensil, go and fetch some water, you look after the young child, go and sell some ice.” So you find that if she is in school, she is more comfortable than in home. Then you find that most of the children, they come from very poor family. The parent, most of them died of AIDS. Most of them? Of your students, how many have lost at least one parent to AIDS? In my class, I have ten. Ten who have lost both of the parents. Six who have lost one parent. And some of them are staying with their grandmothers or grandfathers. Or some of them are staying with their relatives, which is very difficult for these children. You find that a child comes to school, perhaps he has not taken any breakfast at all. Perhaps he has not taken even lunch. So you find it is very difficult for this child to learn. You find some of them sleep on rags. When they come back to school, some of them have not bathed. They are smelling [of] urine, because of where they sleep. They don’t have proper health, some of them. You find with some scabies on their skin. You talk, they are scratching themselves. But they are in class. Some of them are determined to learn but the condition in their homes is keeping them behind. They don’t focus in the class. They have very difficult situation. Then you find, if there is many in the class, to handle them is very difficult. One hundred. How can you handle 100 in a class? So you find that those who are willing to learn, they are very good. Those who need to be pushed, it is really a problem, a very big problem. How do you manage not to lose your spirit as a teacher? I love the work so much. Because of loving the work, it makes you to at least try to understand those children. You try to find out why one looks very weak in class. You call them one by one, they start telling you the life history at home. Then you start feeling sorry. Those are the problems we have but we love the work so much. But because we have large numbers, it is very hard to handle them. Very hard to handle them. But if there could be few, or if there could be more teachers, the work would be very easy. Primary school is free, but what do people do to raise money for uniforms and school supplies? You find that the government, the money that they give is on the basic needs of the school: textbooks, exercise books and pens. But uniform, the parent has to provide. And you find that, these parents, most of them, they are poor. They can’t afford buying the uniform. If one works for perhaps one hundred shillings a day, will he afford to buy a uniform? It costs perhaps 600 or 700. If he earns 100 shillings a day, he has to save 20 bob a day to buy one uniform. And if the parent has something to do with six or seven children, how long will he save to have these uniforms bought? And how will you save at the same time [that] the children want to eat. So you find it is very, very hard. But the government does not provide uniform[s] for children in primary school. Do you think it would help if the government got rid of the uniform rule? It is very necessary for a child to have a uniform because if this child is not in school, it is very easy for one to identify that this is a student. So in case of any problems, the child is easily identified. Then again, a uniform is like a discipline. You find that, perhaps some of them come from good families, now they will come to school with good clothing. These others, they have rags. But the uniform keeps them on the same line. But can’t you tell how well-off the families are by how worn the uniforms are? You can tell the difference. But at our school there are some people who sometimes volunteer – the churches – they chip in by buying them uniforms. Those who are in rags, they help them buy uniforms, bags, some shoes. I have a child whereby this child does not want to be at home. He loves me so much, he would wish we could go with him to my house. He thinks I am coming from a very rich family because of how I handle him, how I listen to him. Whenever somebody abuses me, whenever somebody beats him, he would run for me. So he is more close to me than even the parents and I am very happy about that. Very happy, indeed. I wish I could be having more to provide for these children. How do you deal with that? If you have 50 students who can’t afford lunch, what do you do? Sometimes in our school, the teachers are so much giving. Some of these teachers would come with clothes from their homes, to give [to] these children. Sometimes teachers provide lunch for those children who are not going for lunch. Because we find that, the bell goes for lunch, if you go around the classes, you find some of them sleeping. You feel so bad. We sacrifice, instead of going to eat lunch ourself, we sacrifice out lunch for these children. Do you meet some children who are so determined about their education, to raise themselves out of poverty? In fact, in my school, there are children who come from very far. They have to wake up at around 4:30 to walk to school, 4:30 to walk to school! Sometimes it has rained but they have to walk to school. On weekends, they have to sell firewood. You meet them, they are carrying charcoal, you meet them carrying firewood, because they want some food. They go sell the firewood to buy food. He is very determined to learn. His name is Hanisi. I have another one who is called Kombo. In Class One I have four girls, one is Pili, another on is Mlongo, another one is Lois Moti, another one is Meyu. They have to wake up at 4:30 to walk to school and they are very young girls. Barefoot. If you look at their legs, it has some cracks because of walking. In fact, I remember there was a time whereby there was a case, some two young girls were going home from school. One was raped on the way back home. Now you find that they are risking their own life just to come to school to learn. It’s a pity. I really pity them. If they come to school, perhaps it’s raining. They don’t have umbrellas. The rain, where it gets them, it will rain on them until they get to school. Then again on their way back home, if the rain comes, it will rain on them until they get home. But tomorrow, they will not fail to come to school. I’m very happy about these children. I wish they could get somewhere else to live. Or perhaps if the school could build a small boarding school for those needy children, I think they would have done a very good thing. What is a simple thing that would make a difference for those students? If they could provide lunch, just lunch program for these children. If they could get something to eat during lunch hour, I think this one will make them more determined to come to school because some of them, they will really walk from home to school. But you find that the energy wasted coming from home to school, then you come to sit in a class, listening to a teacher on an empty stomach. But if you are sitting in a class on an empty stomach and your mind is telling you that there is lunch after you have sat in the class, you will not sleep. Just a lunch program, it would really help these children. What is the one thing that would improve the quality of your life? Good leadership. For example, we find that some of us are farmers, we have some small businesses. Perhaps I have three mango trees or four mango trees on my farm. If I can get somewhere to sell these mangos and get something to lift me up, then I think I don’t have to go to somebody to help me. Mostly the sufferers are women. You find that in our local areas, men tend to leave their women at home to go and work very far away, leaving these women with their children. Whereby the child, if he’s sick, it’s the mother to take care. There’s no firewood? It’s the mother to take care. There’s no food? It’s the mother to take care. But if I’ll have an opportunity of selling my mangos, perhaps… not by somebody to come and get my mangos for two bob, and he goes and sells them at 20 bob a mango; that is exploitation. But if I can get good leadership, that would listen to my problems, then I think that one would help. All practical needs aside, for you personally, what is one high dream you have? I have children. I am happy the government has provided free primary education and perhaps they are saying they may provide free secondary education. But my fear is, these children will have to go to university. If you find that the secondary and the primary are free, now taking these children to university will be very expensive. If perhaps, they could be providing loans for these children to undergo the university, then I think I don’t have any problem. Because you find that, today, a secondary education is not enough. And most of us, we can’t afford taking our children to the university. Universtities are very far from where we come from. And I have to provide where my child is going to sleep, to eat and how he or she will be going to the college. And you find that now I don’t have that money. If I could only afford to be taking my child to university, that is my biggest dream. There are a few things that are fundamental to survival in Kenya... food, clean water, shelter, and a cell phone. As far as I can tell, almost everyone here has cell phones.The women in power suits and pumps in downtown Nairobi have cell phones. The students living in Kibera have cell phones. The newspaper correspondents in Kisii have cell phones. The sustenance farmers in the Rift Valley have cell phones. Cell phones are a hot item for pickpockets. There is a thriving black market in them. Almost every corner kiosk sells phone credit scratch cards. Entrepreneurs across the country are recharging cell phones from old car batteries, since so many people have no electricity at home. But there is still a wireless digital divide in Kenya. It is only the poorest and youngest Kenyans who don't have mobile technology. There are countless articles and theses about how wireless communications tools are helping the developing world leapfrog over lack of land-based infrastructure. You can read more about it here and here. Giving up Skype and Facebook, mp3s and e-mail was pretty easy during my week of voluntarily living on the quiet side of the digital divide. But living without the cell phone was not so simple. I don't have a car, so if I need to get around after dark, I usually call a cab. I don't have a land line at home, so contacting people to arrange for meetings or pick-ups was just not possible. That meant a lot of pre-arrangement and a couple of cheating calls. But living without a cell phone got me thinking about the social hierarchy that emerges through cell phone culture here. Judi, Wambui and I were sitting in a bar in South B, deep in discussion about dating younger men, when Wambui said, "No. You can't date them. They will never call you." "They'll just flash you," Judi said. Most folks pre-pay for their phone minutes, so if people are frugal, they won't initiate a call. They will send you a text message (here, called a SMS), which costs only about 10 cents. If they want to talk to you, but don't want to spend any of their credit, they will flash you: call your phone and quickly disconnect before you pick up. The expectation is that you will call back and cover the costs of the conversation. For Wambui and Judi, if a guy never calls on his own credit, it's like someone asking you out on a date and then asking you to pay for dinner. Some US friends and I often talked about how cell phone conversations are becoming a form of performance art in the western world. The 17-year-old in line at the grocery store in Bangor might seem to be enjoying that strangers are listening in as he talks about the killer party he went to last night. Some political activists pose as fake shoppers having cell phone conversations about how a store's product is made under unfair labor conditions. Here in Kenya, cell phones speak of much more than politics and performance. Like the question of shoes, what phone you carry and how you use it are indicators of economic and social status. I am glad that my week in the 70s is over and I can get back to blogging (stay tuned for a flurry of posts). I didn't really miss the plethora of web-based communication tools at my disposal in the twenty-first century. But living without a phone for a week put me on par with the poorest or poor Kenyans. It was dangerous, difficult, and I'm glad that it is over. As I continue with my week of living in the past, here is a great article about the future. A friend has asked me to live for a week as though it were 1978 in Nairobi. That means living on the quiet side of the great Digital Divide... no cell phone. No e-mail. No iPod. No Facebook. No Skype. He says I have to hire someone to transcribe my writing for work or buy a typewriter. A typewriter!! I am going to do one little cheat, though. I'm going to keep using my digital camera. Because my one concern is you, dear blog reader. What will happen if I stop posting regularly? Will your over-taxed technology eyes get pulled away? I'm hoping to tempt you back here with the possibility of contraband photos. I am writing this post on Tuesday, and setting it up to go live later this week. I'll pre-compose another post for early next week, then I'm asking you to check back in the middle of next week to see how the experiment went. I'll post my contraband and some thoughts. But I'm thinking the task might not be as hard as it sounds. Most of the people in Nairobi are still living like people did 30 years ago (except everyone has a cell phone). I'm thinking, when it's my friend's turn to live as though it were 1970s North America, he'll have a harder time adjusting. And he'll be the one wearing bell-bottoms and a sparkly t-shirt. 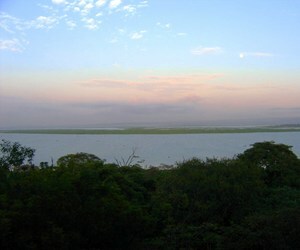 A soundscape of dawn over Lake Victoria. Can you hear the fishermen in the canoe? I'm currently limited to 60 second mp3s, but am hoping to post more soon. If anybody has suggestions for how I can get rid of the hissy dither, I'd be glad to hear them. It's called post. Do it. If you document it, we'll post your posting in a post. I'll send you post in return. Well, one Kenyan at least. In the spirit of inter-cultural education, I'm posting her comments on some recent blog posts. This is Juliana Omale, one of my bosses at AWC. I have thoroughly enjoyed your observations from October 4th and back to September 12th (which tells you the last time I read!!) The matatu piece is rib-tickling but also thought provoking. Actually the logos and designs are responsible for a whole informal sector industry in graphics and auto body-work (keeps a lot of people busy and they earn some money for their labours). In Nairobi and a lot of other places, getting your matatu to fill up especially in the off-peak time depends on the age of the vehicle, its livery and the attitude of the crew. There are a lot of angry parents of teenage girls who run off with matatu touts and drivers (many to a sad end once the romance peels off and its time for reality checks) and the matatu sub-culture among young people cannot be ignored. I like to think of it as Expression on wheels. Your observation about food is very deep. When I was little, my parents never stopped reminding us about people going hungry in our rural villages (those were remote far flung regions in those days). My mother used to recount to us a time in her life after her father died when all they got was a boiled potato, sometimes cut into half dipped in salt and a big measure of water to wash it down. These days I tell my own kids that the hungry live not too far away from us. Perhaps next door or amongst their classmates. I had friend (now deceased) who would shed tears when her daughter and twin sons pushed back their half eaten meals. She would stop what she was doing to sit herself in their faces and shovel the food into their mouths until their plates were wiped clean or if they began to gag from being to full and crying, she would let them off with a reprimand and proceed to finish off every last morsel on the three plates. I used to joke with her that mothers were the ultimate scavengers, eating cold food off their kids’ plates all the time. My kids couldn’t understand Wacuka but they learned quickly that when we visited Auntie Wacuka , it was best to ask to be served a measure that could be finished. NO WASTING FOOD. In your blog about the little boy at the Coptic, it is true that Coptic is relatively cheaper than most private hospitals. Actually it can be classified as a mission hospital (affiliated to religious organizations – in this case the Egyptian Coptic Church, I believe) – which tend to offer quality service at a highly subsidized rate. Kenyatta National Hospital is a public facility – the largest teaching and referral hospital in East and Central Africa. Health care is cheap and the benefit to patients is that they are attended to by Kenya’s finest doctors and health care personnel. The only trouble is that the public health system is understaffed, health workers overworked and the queues are at best impossible. Yet many Kenyans cannot access quality healthcare even in the public health infrastructure. On paper it is free, but they are required to pay Ksh 20/- for registration, laboratory charges, X-rays and other diagnostic services It is not uncommon to receive a prescription for which one must pay. Its no wonder that the poor will continue to die from preventable illnesses, and the burden of disease continues to rise. I was pulling the meat off the chicken when Agnes stopped me. She was helping me make lunch for the office happy hour on Friday. I’d made a big pot of chicken stock out of a couple of chickens, handfuls of red onion peels and other vegetable ends. The stock was the base for my latest recipe: pumpkin, chicken, collards and groundnut stew. When I looked up from the chicken, Agnes had one corner of her mouth upturned and the opposite eyebrow raised. She was teasing. Kind of. My turn to tease, but Agnes and I both knew we were talking around a real question. |We talked about how bones aren't considered food back home. We debated over the stock too, after I left the cloudy dregs in the bottom of the pot. “But that‘s the best part,” Agnes said. I talked jokingly about the French ideal of perfectly clear, golden stock. She shook her head. We compromised. I left the bones in the soup, but kept the broth clear. Doing the dishes after lunch, I saw George and Alex had both picked the chicken bones clean, but left the collards and half-bowls of stock behind. The boy’s hand is about four inches from my face. He’s stroking his open palm like he’s wiping away a persistent crumb. We are walking down the road outside Yaya Center: ex-pat central. As with so many Kenyan kids, I can’t guess how old this boy is. The top of his head is about even with my shoulder. The boy’s been walking along beside me for about a block. I’ve got my arms crossed and my head down. I can’t quite bring myself to look at him. I’ve made a rule that I won’t give money to kids who are begging on the street. It’s not based on any clear philosophy, except that I’ve heard about swarms of kids who appear when you hand one child a few shillings. I have a hard enough time saying no to one kid, let alone a crowd of them. My rule is, I suppose, some kind of psychological fall back position. I think the boy can tell I'm uncomfortable. He's getting more insistent. I keep right on moving as he stops and watches me walk away. Heavy-headed and sullen, the small boy looked as bad as I felt. He was crouched on the ground outside the Coptic Hospital’s pharmacy, his head resting on the old wooden bench where his mother and I were sitting. Guessing by the envelope that read “Chest X-Ray”, the boy had just been diagnosed with some kind of lung infection. I’d just found out that I had typhoid and bronchitis. I empathized with his drooping eyelids and generally lethargic air. Coptic Hospital is a good, church-run medical center in Nairobi. For general care, the service is fast and decent and not as expensive as Kenya National or Nairobi Hospital. Patients at Coptic have to pay for every service in advance. That means four or five trips to the cashier’s desk. For me, that meant, $7 US to start a file, $4 to see the doctor, $7 for a blood test, $18 for antibiotics, expectorant and Ibuprofen. I had made my final payment and was waiting for the chemist to assemble my drugs. Just as she started talking to me, I noticed the woman beside me was still holding the bill for her son‘s medicine, not a cashier‘s receipt. She dropped her hand with the receipt into her lap. Her other hand held a red cloth change purse. It was conspicuously flat. I looked at the x-ray envelope again and wondered about the price of the test. I took a closer look at the mother and son. She was wearing a decent second-hand dress and his pants and t-shirt weren’t too worn. But it’s the shoes that give people away. Her sandal soles were worn thin in the heal. The vinyl around the buckles was deeply cracked and looked about to snap. The boy was wearing plastic flip-flops, the universal indicator of poverty here. In Kenya, plastic flip-flops are solely for bathroom use. You only wear them in public if you can‘t afford anything else. Another Kenyan woman sitting farther down the bench talked to the sandal-wearer in Kiswahili. After a short exchange, the mother left her boy sleeping on the bench and walked over to talk with the chemist. The woman nodded. She was wearing black leather high heels with buckles over the pointed toes. The toddler in her arms was wearing a frilly pink dress to match her pint-sized Mary Janes. “Oh that‘s no good,” I said. Once the boy’s symptoms start to abate, I was thinking, she won’t come back... not with the cost of the rest of the drugs, plus the expense of time and money to come down to the hospital from Kibera or Eastleigh. I was shaking my head. So was the woman farther down the bench. Skipping the full course of antibiotics, the boy's infection might return in a couple of weeks. Also, over-use and misuse of pharmaceuticals is helping all sorts of bacteria become resistant to antibiotics. The boy’s mother came back to the bench empty-handed. The boy was still sleeping, head on the bench as I left. It’s only when I got home that it occurred to me, once his symptoms abate, she might just sell the rest of the medication to some other mother with a sick kid and use the money to buy them new shoes, or food. The Rift Valley, Kericho and Nandi Hills are the primary agricultural zones in Kenya. The green terraced hillsides and maize-covered fields produce a cornucopia of fruits and vegetables for sale across the country, as well as tea and coffee for export. When we stop in a small village on our way to Kisumu, women crowd the car. I can smell the sweet, ripe fruit that they are shoving in the windows. My colleagues are negotiating prices. They get one woman down to a little under 75 cents US for a perfect, yellow pineapple. People here have food, but not cash. In the colder climate of the Rift Valley, the roadside goods are potatoes, carrots and peas. I buy a bushel of fresh peas for about $2 US. That evening, the peas are in a big pile beside me in the front courtyard at home. I’m sitting on an overturned bucket, slowly working my way through the pods. “You look like a girl from a village,” saysJoy, my landlady. She is teasing. Kind of. Joy's daughter Ruby is my roomate, a 28-year-old lawyer with a shoe fetish. Ruby’s shoes are scattered around this courtyard: there are open-toed pumps with flowers by the gate, ruched black ankle boots and pink mules near the door, old-school Converse high tops and black Vans on top of the cistern. There are more shoes inside. More than 25 pairs are arranged on a shoe stand at the bottom of the stairs: zippered, buckled, pointy-toed and round; bright green, orange, pink, white, silver, black, gold; Mary Janes, kitten-heels, sequined stilletos, flats, sling-backs, beaded sandals. I have never peaked in Ruby’s bedroom, but I bet there are more shoes in there. “I hate to cook,” Ruby says, walking away. She has told me that she also hates cleaning. And doing laundry. Her mother sends a house girl over ever Saturday to clean the house and wash Ruby’s clothes. As we shell, I am watching a bucket slowly fill with water for my washing, which I will do by hand. I also acknowledge that I might not like it so much if I had to do it, if I never had the option of paying someone to scrub my dirty clothes or cook for me. Joy helps me shell peas for a while, but I only get through three-quarters of the bushel that night. They go into another new recipe: fresh pea soup with cumin. A few days later, when I’m looking for the soup, I see the remaining three pounds of unshelled peas in the fridge. I know I’m not going to get around to using them. I pull them out and for about two minutes, I stand in the middle of the kitchen, wondering what to do. I remember when I was a kid, people saying, "Finish your supper. Don't you know that people are starving in Ethiopia?" It never made sense to me. How was eating every soggy carrot on my plate going to help anyone in Ethiopia? But here, left-overs do make a difference. I know that just a 30 minute walk from here, kids in Kibera are digging through garbage piles, looking for dinner. I tie up the bag and toss the peas in my backpack. I don't know who I'm going to give them to, but I am sure that someone close by can use them. I am in Kisumu today, helping to give a workshop today on gender sensitive reporting and human rights. Raila, the chief challenger for the Kenyan presidency, is also in town today. He’s from this part of Kenya, bordered by Lake Victoria. Although I’m in the midst of giving an hour-long session on human rights and essential journalism skills, I’m really getting a crash course in journalism in rural Kenya. Another correspondent chimes in. The Nation is one of the two major daily newspapers in Kenya. This, I tell the group, is my point. By being ethical, fair and balanced in their strories, their readers and listeners will begin to trust what they report. But the media here in Kenya, despite being more free and fair than the press in many African countries, is still rife with bias. Poverty plays a big part in it. Most of these correspondents make about 15000 Kenyan shillings a month, according to Oloo Janak, chair of the Kenyan Correspondents Association. That’s about $250 dollars USD: much more than most Kenyans make, but still very little money on which to support a family. Despite generating 70 percent of the content for the various media houses, correspondents are paid very little. And they are paid by the story. That means, by spending the day here, instead of covering Raila’s visit, they are giving up a chance to make significant money. Nikki at Journalists for Human Rights told me that most reporters in Africa make most of their money by being paid to attend press conferences. Janak says that doesn’t happen much in Kenya. But across Lake Victoria in Uganda, he says reporters often negotiate the price of press conference attendance and favorable coverage before they leave the office. 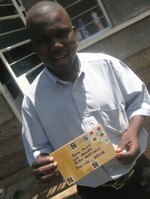 Here in Kenya, Janak says, it’s more a case of “the brown envelope.” Many reporters take money from politicians and other wealthy interests, for writing stories that are neither fair nor balanced. We talk about bias in reporting, how it can creep into what stories we choose to cover, who we decide to interview, how we interview them, and then into the language we use in our stories, columns and scripts. “I assign someone else to cover the story,” says one good student. Despite the humor and understanding today, as we talk about the essential journalism skills that underpin fair reporting, I know that there are some of these reporters who will accept bribes to write stories with particular slants. The bribe might not always be as overt as Janak’s “brown envelope”. The reality is, if John is trying to support a family on less than 15000 shillings a month, he can’t afford to pay for his own transportation to interview a political candidate. So he will let the candidate’s driver pick him up and drop him off. If a business man wants to buy him lunch while they talk about why tea pickers aren’t really all that underpaid, the reporter will listen. As he’s sitting at his desk, putting the story together, he is likely to remember that his full belly is thanks to that business man. If John chooses to interview someone who says it’s not fair to paying people less than two dollars a day to pick tea for a multinational corporation with a bulging profit margin, the reporter knows that the business man is not likely to take him out for lunch again. He might send thugs to the man’s home. At the very least, the business man will not grant the reporter’s next interview request. And that may mean one less story for the reporter to sell to Nairobi, one less meal on the table. Here, not getting your story on the front page doesn’t just mean lower status in the newsroom, it means not eating dinner or not paying your child’s school fees. And if your story is seriously critical, it might mean not making it home for dinner, or not making it home at all. Ever. It’s not just rural reporters who are threatened with violence. I have had people call me to complain about stories. I’ve had people send messages to my boss, complaining about how I covered an issue. But I’ve never been physically threatened. I don’t have an easy answer for these correspondents. Do what you can. Write as close to the edge as you dare. Be accurate and fair in your reporting. Hope that your reputation will protect you. Hope that as the Kenyan press becomes gradually more free, threats and violence against journalists will become less common. Because journalists everywhere do have an intimate relationship with human rights. The rights to freedom of expression and association make it possible for us to work in a *relatively* free press. Media are also the vehicle by which other people exercise their rights to free expression and opinion. They are also the educators for the majority of Kenyans. People here do read the papers. They talk constantly about news and politics. Kenyans eat dinner at eight o’clock, once the evening news program have signed off. In fact, as I sit writing this in a bar overlooking a darkening Lake Victoria, about 25 people are gathered around a small television. Even the bar tender has abandoned his post to watch reports about recent presidential poll results and Raila’s visit to Western Province. I know, and hopefully 30 rural correspondents are now reminded, that the more in-depth and accurate those stories are, the more dynamic the civic dialog (human rights and all) will be. And hopefully, the more the Kenyan press develops a reputation for fair reporting, the more likely those correspondents will be to make it home for dinner, with a few more shillings in their pockets.